Is ‘Black the Fall’ Part of a New Subgenre of Video Game? 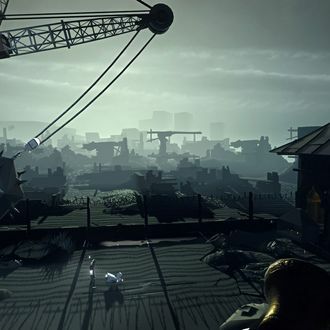 There was a moment early in Black the Fall, the new two-dimensional side-scrolling survival game from Romanian developers Sand Sailor Studio, that got under my skin way more than it should have. 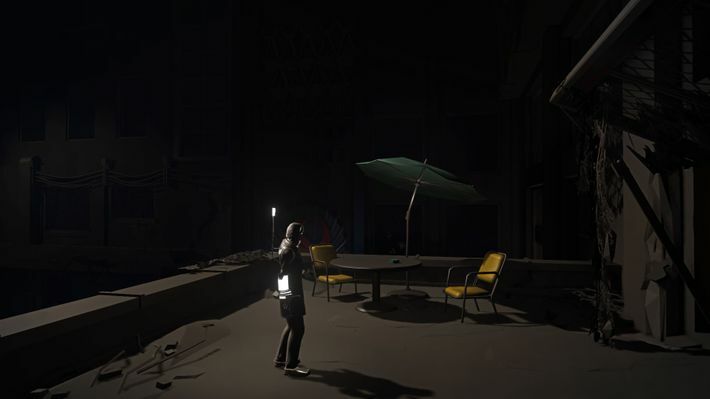 I was trying to navigate a giant, sprawling, dark industrial space riddled with danger, and suddenly I came across a decaying patio-furniture set: two chairs, a table, and an umbrella. Wasn’t I traveling through an indoor space? Why was there outdoor furniture? What was going on — or, maybe more to the point, what the hell had happened? But Black the Fall never answered that question, nor most of the other questions raised by its other, more epic set pieces. I kept traveling through its eerie world, haunted by the patio furniture. And that was, more or less, the point. Black the Fall, published by Square Enix, takes place in a retro-future setting in which a brutal communist regime like Ceaușescu’s has held onto power long enough to enact near-total technological control and surveillance over the populace. You play as a machinist who attempts to escape “after decades of toil” under the thumb of the regime, as the game’s website puts it. The game world is suitably grim and metallic and postindustrial, with cameras and robots and various smoke-spewing machines everywhere. Black the Fall emphasizes, early and often, the extent to which the regime’s technology has been turned against its people, and just how unfair a fight this is — when one of the game’s many turrets kills your character, he simply evaporates into a puff of ash. Manipulation is the other theme that hangs heavy over the game, both in terms of the puzzles you have to solve — many of which involve using a laser pointer to get slave laborers or a friendly little canine robot to do your bidding and help you progress by pulling levers or activating pressure plates — and in the environments you travel through as you attempt to survive. The regime still needs to puff itself up as big and important and revolutionary, despite having resorted to slave labor, despite the decaying factories and polluted pools of water and other signs of decline littering the landscape. Photos of communist heroes abound, as do the letters PCR, the initials of the (real-life) Romanian Communist Party; at one point, you stumble upon a scene in which one of the regime’s hulking, murderous overseers appears to be orchestrating a camera shoot to fake a bountiful harvest. Crops sway in a fake breeze under fake sunlight. Black the Fall pulls off these sorts of memorable set pieces really well, whether it’s the little things like that outdoor furniture or the bigger ones like sprawling scenes of concrete waste. And that’s part of the reason it has garnered endless comparisons to Inside, a brilliant game released by Playdead last year. And in fact, they are very, very similar. Black the Fall isn’t quite on the same level, in part because the controls aren’t tight enough, and in part because its real-world-history-informed story doesn’t approach Inside’s level of engaging dark weirdness, but both are very much worth playing. Why Won’t Video-Game Companies Even Talk About Employee Harassment? And it could be argued that these titles, alongside Limbo, Playdead’s earlier hit and clearly the inspiration for Inside, constitute their own novel subgenre. They all share some very specific characteristics that make them what they are: In all three games, you play a frail, weak character who dies constantly and who can’t really fight or destroy the vast majority of the dangers you face; all three are 2-D-side-scrollers that occasionally dip into a mostly unused third dimension in interesting or surprising ways (sometimes, Black the Fall, like Inside, will suddenly pivot its perspective, Fez-style, allowing you to proceed past what would otherwise be an impassable obstacle); all three involve giant, ruined industrial settings that dwarf your character; and all three offer tantalizing glimpses of rich, sprawling stories — but only glimpses because very little is explained, and all that matters is survival. When I raised the possibility that these games are part of a new subgenre on Twitter, a few people argued otherwise, saying that they’re really just carrying on in the legacy of old titles like Prince of Persia, Another World (a.k.a. Out of This World), and Oddworld: Abe’s Oddysee. But while Another World comes closest, none of these games quite qualifies by the criteria I’m proposing — they either have traditional combat in which your character isn’t a helpless weakling or traditional storytelling with text. Moreover, until fairly recently, given certain technical limitations it would have been hard for small indie studios — the studios making these sorts of games — to even create set pieces that pack the punches the ones in these titles do, given that those set pieces often rely a great deal on smooth animation, intricate camera work, and impressive lighting. Maybe I’m missing other examples, but either way, games of exactly this type are rare, have a very distinct feel to them, and three notable examples have been released since 2010. Surely copycats are in the works. What can this tell us? One answer has to do with the ongoing, unresolved question of how to comfortably marry “real” games with mature storytelling. Think of it this way: On one end of the spectrum are all-gameplay games that don’t really try to tell a story, like the soon-to-be-hit survival-combat title PlayerUnknown’s Battlegrounds (which is currently in beta, and which seems to be generating a hundred hours of wildly entertaining Twitch footage per day). At the other end are “walking simulators” like Gone Home that tilt heavily in the direction of storytelling, often at the expense of all but the most rudimentary gameplay elements. Games that try hard on both fronts often suffer as a result — think GTA IV’s boring, onerous relationship-building system (no, I don’t want to go bowling, but I also don’t want to be punished for not wanting to go bowling), or any of a trillion other game’s unwatchable, poorly voice-acted cut scenes yanking you, the player, out of the action. Limbo, Inside, and Black the Fall all successfully have it both ways because they imply big, epic, complicated, tragic stories without actually telling them. The set pieces do the storytelling work implicitly, and the puzzle-and-platforming-centered gameplay is solidly, and sometimes ingeniously, executed. This is an interesting middle ground — a “story” that consists of a single playable imperative, like ESCAPE or SURVIVE, draped in all sorts of and mostly noninteractive scenery. By the time you reach the end of one of these games, you feel like you would eagerly read a well-crafted novella explaining how the twisted world you just traversed got so broken. But the game itself was much stronger for having never asked you to.